Often when one walks into a school one feels this is a good school. The school maybe in middle of a bustling habitation or in a remote spot, it may be huge or just have two rooms and a few basic facilities, perhaps only one or two teachers, children sitting on the floor. But somehow, after a few minutes in the school, you feel that this is a good school. What made you feel that? Was it the sound of children talking and laughing happily? Was it the concern and care observed in the teacher-student conversation? Was it the spotlessly clean and colorfully decorated building? Or maybe the fact that you noticed parents unhesitatingly coming in and out of the school and talking to the teachers. Was it because most children could read fluently and do age appropriate tasks? Or that all the children looked neat and tidy, with their hair combed and confident? Or the school had very sound infrastructure, ICT facilities and the teachers were confident and committed. Or any other reason…something that made you immediately feel that this school is different from the many other schools that you have seen or been to. Schools can be good schools for many different reasons. Each of us has different ways of looking at schools. Each of us has different things that we value and cherish. Some of these schools; for all you know were not like this, some 2, 3 or 5 years back. What brought this transformation then? Is it with the change of leadership or the governance style or increasing healthy collaborations and/or learning methods that the school has undergone a transformational journey? NCSL, NIEPA’s Celebrating School Leadership (CSL) invites District and Block Education Officers, Heads of Schools, Teachers, Researchers, Administrators, NGOs, Research institutes and Academic Institutes to write us about good schools in the government system and about their transformational journey and leadership. While we all know, respect and honour our soldiers that protect our country from external invasions, how much do we know, respect and honour our teachers that constantly widen our horizons of thoughts, deepen our insights and guard us against internal enemies. The key purpose of this programme is to recognize teachers, head teachers, cluster, block and district level officers; all of whom have taken up leadership roles in their own capacities in their classrooms, at school, cluster, block and district level to develop an ecosystem that transforms the quality of teaching-learning experience for all. To recognize leadership that transformed schools. 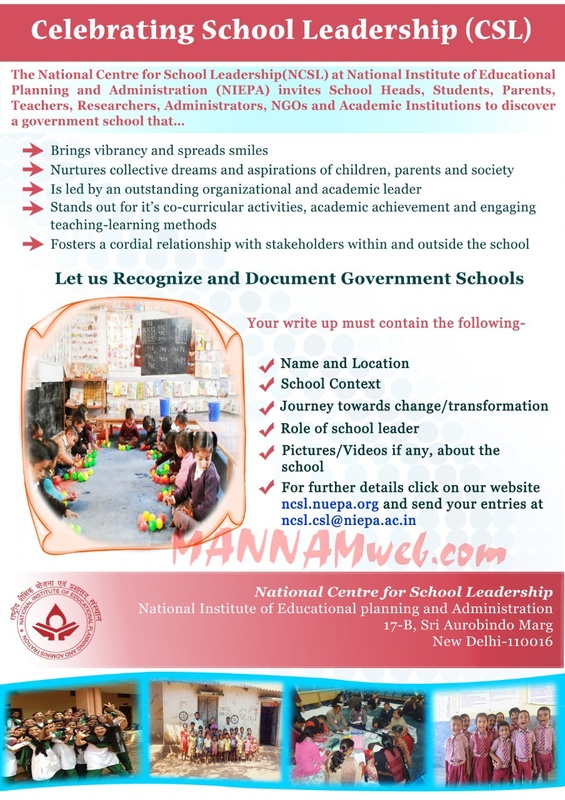 To document the journey and investigate the process and practices in leadership, the overall organization, teaching-learning, community participation and such other aspects of schools’ journey. To draw learning and build a body of knowledge in school leadership studies in India through case studies and narratives. To promote deeper and wider understanding of the functioning of schools in its specific contextual and institutional framework. You could even nominate your peers who you know to have mentored and supported HoS in transformational journey. Or you could be Independent Researchers or Academicians or Practitioners / NGOs and have studied the school’s transformational journey over a period. CSL expects you to submit a case study with appropriate pictures and /or videos of the school that you know or have led towards transformation. A case study submitted for CSL should aim to facilitate the conceptual and behavioral understanding of school leadership, highlight areas of change and lessons on leadership practices therein. It should also promote sensitivity of the readers towards important issues, problems and challenges of school leaders across levels and the initiatives taken to overcome these against all odds. Conceptual issues and processes in school leadership such as: Schools as learning organization, Vision, mission and School Development planning and implementation; principles of school transformation; Equity, Equality, Gender and Social Inclusion, School Safety and Security, Child rights; Culture, Climate and work ethos in schools. Reimagining schools through innovations: Discovering novel ways to address some of the school related challenges, reorganizing time-tables, classrooms to support student learning, thinking differently to meet the resource crunch and improve quality. The case study would be in two parts. The present scenario; key strengths and weaknesses of the school. The description of community - cultural pressures; values, attitudes, needs and expectations; skills, chief occupation. The theory of change – which means the turning points for the school head, the reflections on what worked and why or the ‘mantra’ for change. The write-up could be substantiated with pictures of the events, the pre and post situation of the school, the phenomena of change and videos if any of the school. This case study will be thoroughly reviewed by a committee formulated by NCSL, NIEPA following which NCSL would invite university departments, SCERTs and DIETs to visit selected schools from each state. Part II of the case study would be written by the team of scholars who visit the schools. This case study could be of 5-10 A4 size pages, double spaced using size 12 of Times New Roman font and keeping one and half inches margin on each side of the page. Apart from including all the details mentioned above this case study should give an in-depth understanding of the reasons for the transformed situation and the role of school leadership. It should further highlight the teaching learning processes, the community participation, the overall school organization, the inter-personal relationships in and outside the school, innovations, team work and use of technology for school development. The key purpose of repeating this entire exercise with the help of researchers is to use these case studies for learning, extracting leadership practices from across the country and eventually evolving models and /or theories of leadership that work in Indian Context. Each case study should be accompanied by the following information: title of the case study; name of the case writer (s); address and telephone(s) of the Case Writer(s) and fax/email where available. The case writer(s) should also state whether the case study has been approved for publication by the concerned organization or whether approval is yet to be taken; and, finally, the signature(s) of the case writer(s). CSL encourages active participation of all stakeholders for personal, professional and common academic good of Self, School and Society. 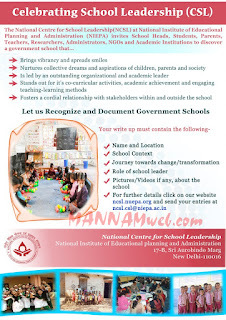 Best 100 schools and its leadership would be certified as Centers of Excellence in school education by NCSL, NIEPA. Best 100 case studies from across the country would be recognized and the school and its leadership stories would be shared on the State and National portals. Leadership at the school level will be given a national platform to share their journey of transformation at the National Conference on School Leadership held by NIEPA. 10 best Heads of schools, Cluster, Block and/or District heads of the selected 100 who have led and transformed their schools would be further given a chance to do a fellowship with NCSL in the area of School Leadership and management.